Hubs are IN in cognitive neuroscience. 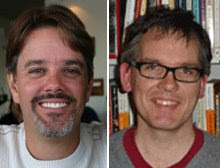 Griffiths and Warren have their computational hub in the planum temporale, and Patterson et al. have their semantic hub in the anterior temporal lobe. Long before the hub we had the convergence zone of Antonio Damasio and the transmodal node of Marcel Mesulam which he described as an "epicenter" (I like that term -- sounds very important). Despite the variation in terminology, the basic idea behind all these proposals is similar: there are regions in the brain that function to integrate information from different brain systems. This seems reasonable, and may even be right. So what do hubs have to do with mirror neurons and puppet masters? Everything, according to a recent paper in Nature by Damasio and Meyer. These authors argue that mirror neurons are not themselves the basis for action understanding, but rather function as a "convergence-divergence zone" (CDZ) -- a "hub" -- which activates a broad network of areas involved in action perception, including oft neglected sensory systems: "The [mirror] neurons ... are not so much like mirrors ..." Damsio and Meyer write, "They are more like puppet masters, pulling the strings of various memories" (p. 168). Damasio and Meyer's essay provides a welcome and rational view on the possible function of mirror neurons in action understanding. I wonder though, whether they are still giving mirror neurons too much credit. I fully agree with the claim that mirror neurons are part of a larger network involving in processing action-related information that is associatively linked via experience. But I question whether mirror neurons are the puppet masters. Maybe they are just a hand on the puppet.